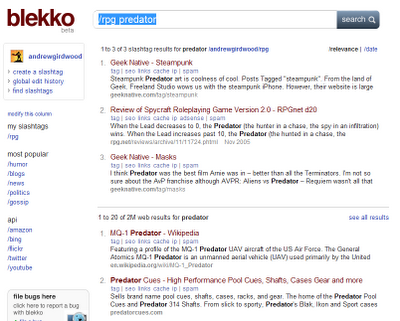 I'm one of the many people to have had had a beta access to the new search engine Blekko. Here's the short summary: I rather like it. I like it because it's modern and up to date. I like it because - and this may seem to be a contradiction - it reminds me of the control those of us once used to command line interfaces used to get. 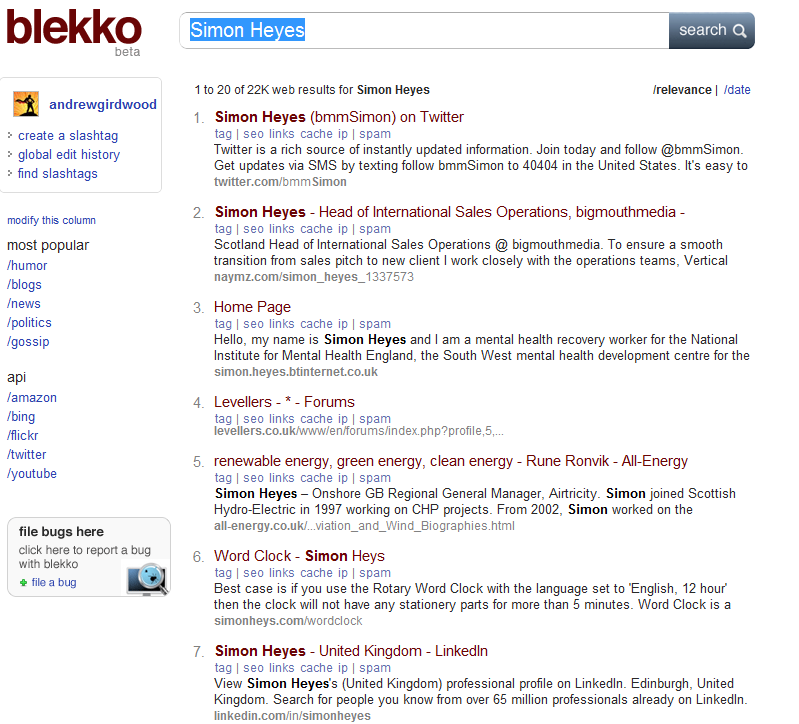 As a relevancy search engien Blekko's good enough. I find sites for keywords. I can find you examples of where Blekko does badly. I can find you examples of where Blekko does well. Bing knows that if you slap a Google logo on these results then people will think they're more relevant. 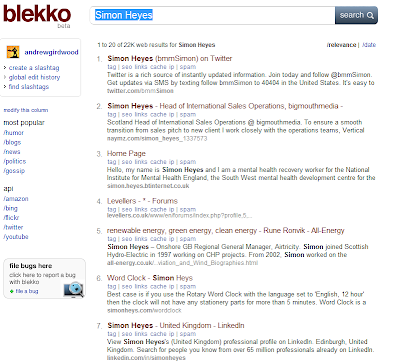 Here's an example of Blekko finding Simon Heyes straight away. You get an username and login with Blekko. 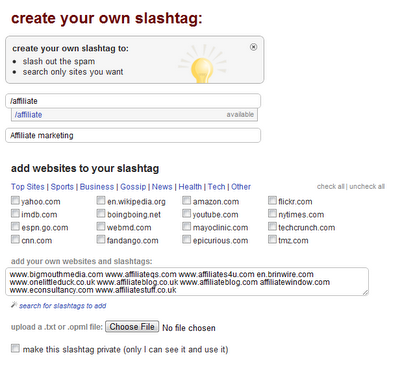 You get this because you get to create your own slash tags. 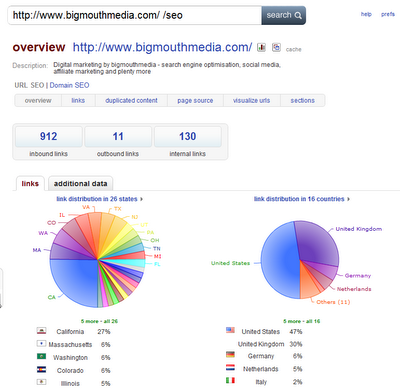 This lets you create your own little search engines from trusted sites. 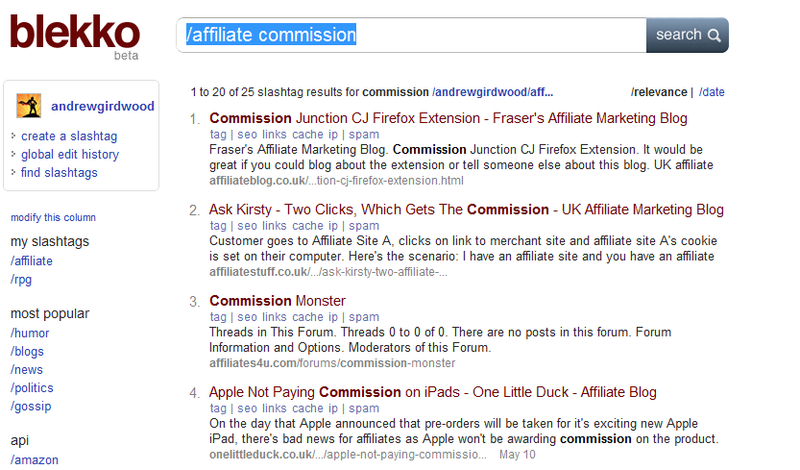 The following screen grabs show the process I used for creating a little list of affiliate sites. 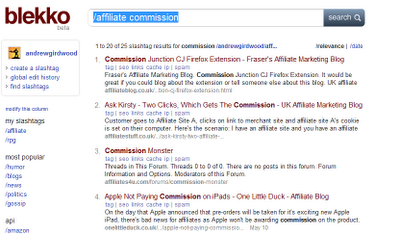 Now when I search within the /affiliate tag I get results just from my slashtag. Of course, if your slashtag can't provide enough results then Blekko backs you up with other relevant sites. 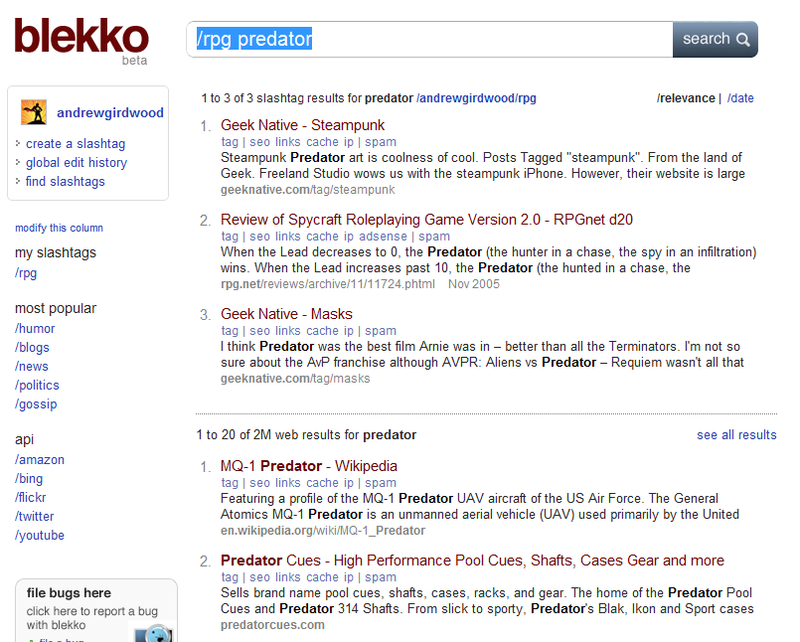 Here's a [predator] search for my small /rpg slashtag. I need to grow that list. Rather nicely you can also embed results. Here's my beta list for SEOs. As you might expect it's called /seos. I think Blekko will enjoy some publicity when it launches. I also think it has a chance of success. 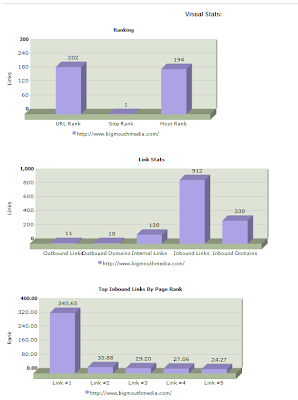 Here's why - we have reason to promote the popularity of our own slashtags. Therefore we have reason to promote Blekko. For example, I might create a list of anime sites (anime is a popular and competitive keyphrase on Google) with a good slashtag name. I control which sites get on that. If I can get people to follow my slashtag (in the same way people follow Twitter groups) then I've influence among the large number of anime webmasters out there. 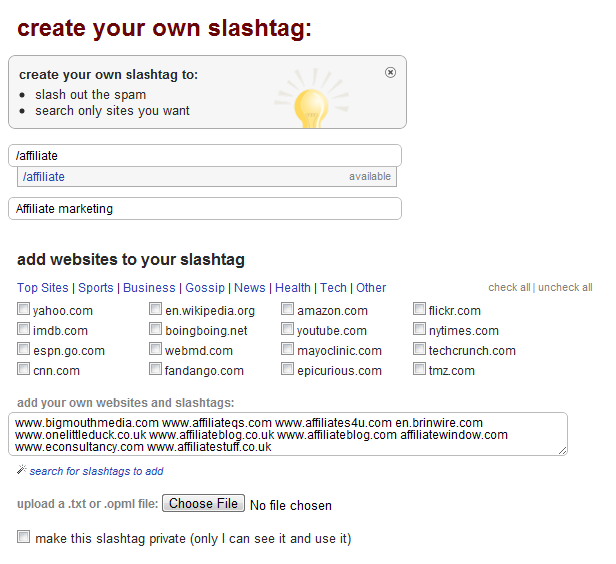 I do wonder about brand squatting on slashtags if Blekko becomes popular, though. Blekko will, of course, also appeal directly to SEOs. They're being public about the data they're looking at (or showing enough to distract us). It's presented in a rather nice way. Take a gander.